Ok, so that last test was a bust. It was clearly one of those days when nothing seems to go right. Not to be deterred let’s give it another try, this time with a swipe. So I’m comparing my ‘old’ recipe of paint, Floetrol, water and silicone on the one side and in the second pour, I’ve replaced half of the Floetrol with Liquitex Pouring Medium. Will there be any difference? Will it all be one big mess again? Hmm, likely. Obviously, I start off on the wrong foot by using the same colors as before because I already had these mixed and left over from the last experiment. They weren’t pretty colors then so they aren’t pretty now either. 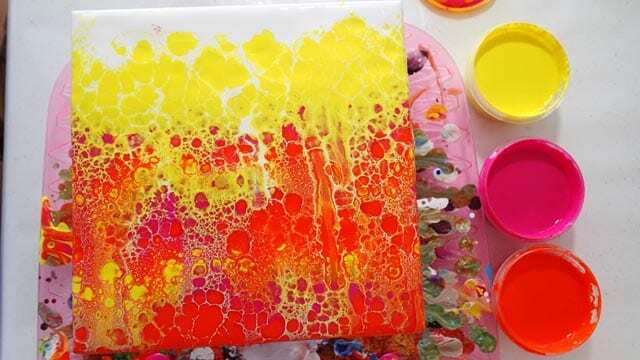 But it’s not quite so bad to look at, because there is more white paint to break up the colors, as a swipe. 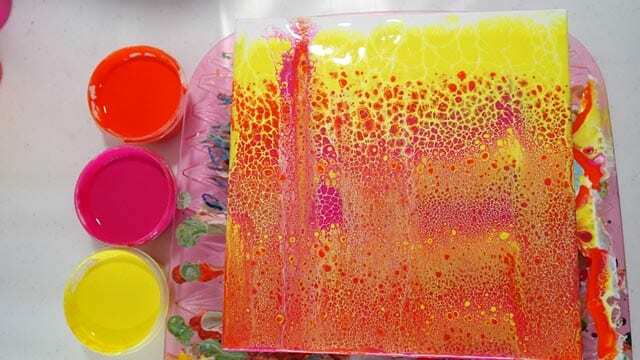 I layered up the paints on the tiles, swiped and let’s see what happened. Hmm, well these two look very different. The one with Floetrol only created a gazillion beautifully defined cells, but they are tiny. 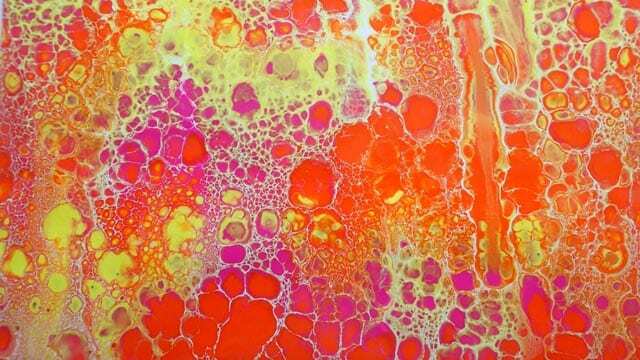 The one with Liquitex created cells too, but larger and softer. On the other hand, I’ve done two side by side swipes before that turned out just this different. 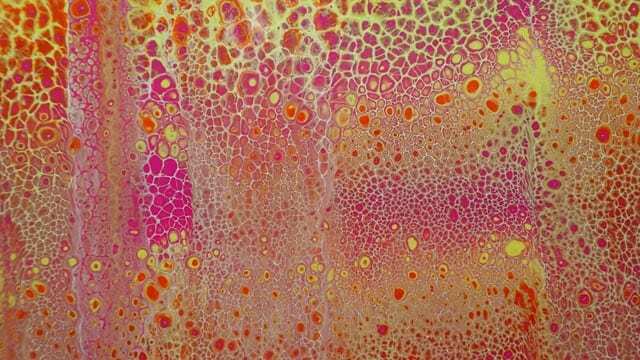 Take a look at my Dragon Scales swipes – one has large cells, the other has the tiny cells. Yet both were the exact same paints swiped the same way. So again, I don’t think I can determine whether there is any difference in results when I use the Pouring Medium as well as or instead of the Floetrol. But I think I can say that from these two experiments I’m not seeing any immediate or obvious difference that would point me in any one direction to say it was or wasn’t worth investing in. The only difference I’m seeing the pin holes. 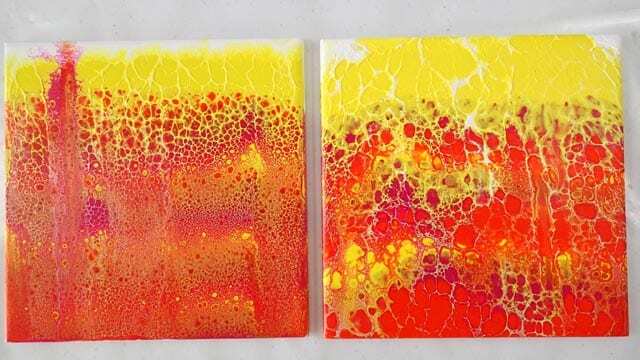 I’ve never had them before, but in both experiments with the Pouring Medium from Liquitex, all the examples had lots of little pin holes in them. Hmm, not so good. My experiments have already used quite a lot of my precious bottle, so now I have to decide what to do next. Another experiment? More testing? More side by side comparisons or just use it and see if I can get a feel for how it reacts? I’ll be interested to hear if any of you have carried out any similar testing and what conclusions you came to. As usual, check out the slideshow below for more pictures of these two swipes, both wet and dry, and some of the closeups of the details. 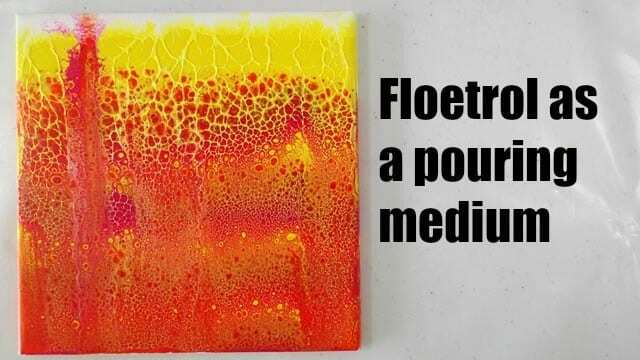 I’m not a fan of Floetrol so far…I think my bottle was made in the days of mastodons…and Liquitex Pouring Medium is, IMO, merely good as a pouring medium. It IS very useful for other projects and I find it indispensable. As always, you denigrate your fine work. Both swipes look beautiful to me and I like the color choices very much. 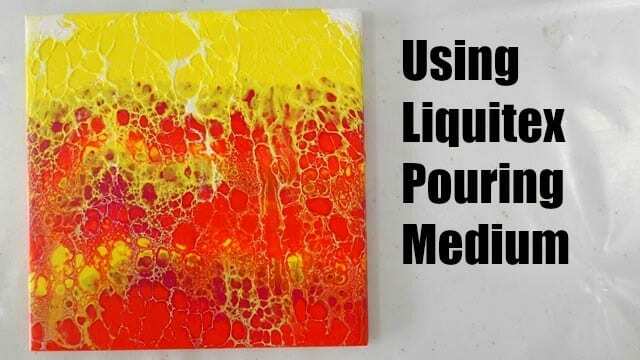 And, as always, your pouring videos are both interesting and informative. And entertaining! A rarity in pouring videos! Thank you Bryan, you are very kind. 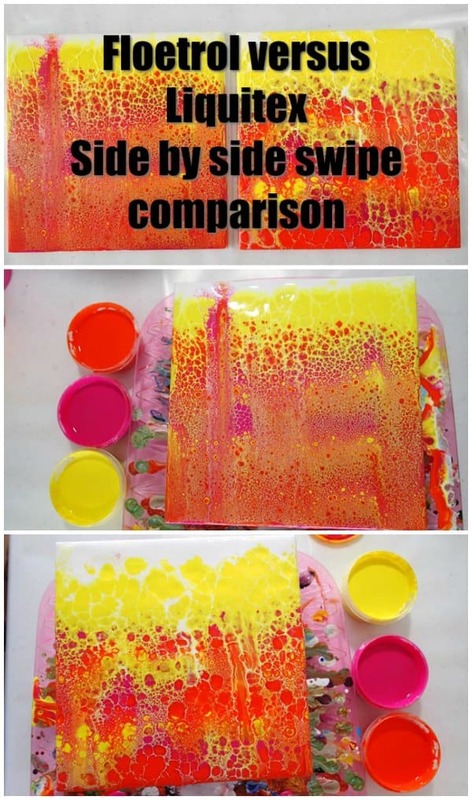 How much silicone do you add to your recipe? I am going to try this for the first time. Thank you! It depends on how much volume of paint I mix up. I would say for the small amounts that I mix in the pots with lids, 2-3 drops and for the 8oz squeeze bottles, I add 10-12 drops in total.